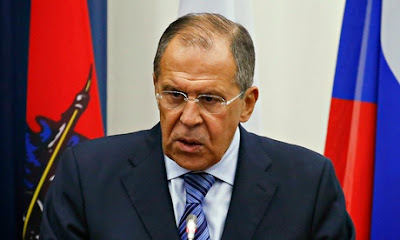 MOSCOW, Russia -- Russia's foreign minister, Sergei Lavrov, has said negotiations taking place in Minsk to resolve the crisis in eastern Ukraine should seek an immediate ceasefire. Russia's foreign minister Sergei Lavrov. Lavrov added that Ukrainian forces must pull back from positions from which they can hit civilians. "They must leave positions from which they can harm the civilian population," Lavrov told students in Moscow on Monday. The Ukrainian president, Petro Poroshenko, accused Moscow of "direct and open" aggression against his country, as forces battled a Russian tank battalion for a vital airport in Luhansk on Monday, and in Ilovaysk, near the east's main city of Donetsk, several hundred Ukrainian forces remained trapped within an encirclement by Russia-backed separatists. In Mariupol, two Ukrainian seamen were reported missing after an attack by separatist rebel artillery on a patrol boat in the Asov Sea. Eight seamen had been rescued, a Ukrainian border guard official said on Monday. The talks in the Belarusian capital will bring together representatives of Russia, Ukraine, the Organisation for Security and Co-operation in Europe (OSCE) security forum and separatist rebels in eastern Ukraine. Vladimir Putin has called on Kiev to enter discussions on "statehood" for the south-east regions of Ukraine a day after the EU gave Russia a week to de-escalate the situation in Ukraine or face further sanctions. In excerpts of an interview with state television broadcast on Sunday evening, the Russian president said talks between Ukrainian authorities and separatist leaders in the east should begin immediately and be about "not just technical issues but on the political organisation of society and statehood in south-eastern Ukraine". His spokesperson later said Putin had not meant the region should gain independence, but that dialogue should begin. Western leaders have accused Russia of fanning the flames of the insurgency in east Ukraine, and in recent weeks of providing direct military assistance, as the armed rebels suffered a number of losses to the Ukrainian army and appeared on the brink of defeat. The EU said late on Saturday that if Russia did not reverse course in Ukraine within a week, a further round of sanctions would be imposed, but there is disagreement within the 28-member block about the effectiveness of sanctions and a fear that more serious measures would also harm European economies. Angela Merkel, the German chancellor, said the sanctions would build on existing measures against Russia. Senior diplomats confirmed the punitive measures were not so much new as a tightening of the restrictions imposed in July on Russian financial, energy and defence sectors. "It's about closing loopholes," said a diplomat. They warned, however, that it could be weeks before any new sanctions were applied, perhaps as late as October. The Senate foreign relations committee chair and Obama administration loyalist, Robert Menendez, called for the US to arm the Ukrainian military. Speaking in Kiev, he said: "This is a watershed moment. Thousands of Russian troops are here and are directly engaged in what is clearly an invasion. We should be providing the Ukrainians with the types of defensive weapons that will impose a cost upon Putin for further aggression." Kiev has said it will not negotiate with the leaders of the self-proclaimed Donetsk and Luhansk people's republics, which it lists as terrorists. But in an apparent victory for Moscow, the separatists said they would be taking part in talks in Minsk this week with a delegation from Kiev. Analysts have speculated that Putin does not want a Crimea-style annexation, which would be expensive and militarily difficult, but instead wants to create a "frozen conflict" that would give Moscow permanent leverage in Ukraine. Since talks between Putin and Poroshenko in Minsk last Tuesday, the situation on the ground has changed, with rebel forces taking control of Novoazovsk in the far south-east of the country, which they are believed to have taken with help from Russian army soldiers and equipment. But the promised assault on the key port city of Mariupol has not materialized. Many residents have been digging trenches on the outskirts of the city and preparing to defend it. Mariupol was under rebel control at the beginning of the uprising but was taken back by Kiev's forces in June and most of its residents have little appetite for further violence, although many remain sceptical about the Ukrainian government. Kiev has said it will defend Mariupol from any rebel assault, though there is little sign of serious reinforcements with which to repel any attack. The majority of the forces appear to be from volunteer battalions. Vadim, a commander in the Azov battalion, known for its far-right leanings, said on Sunday that it was imperative to defend the city because of its strategic importance. "If we lose Mariupol we will lose the war," said the 34-year-old, as he headed to a factory to transport concrete blocks to reinforce checkpoints. Ukrainian forces said two coastguard vessels came under fire off the coast of Mariupol. Videos from the scene showed a plume of smoke rising from an object several miles offshore. It was unclear how the boats were attacked. People in the vicinity said they heard loud explosions but did not see or hear any aircraft, suggesting they may have been hit by missiles fired from land. Russia has denied all accusations that its soldiers are active in eastern Ukraine, stating that a group of paratroopers captured inside the country had got lost and crossed "by accident", and all other Russians fighting in the region were volunteers or serving soldiers "on holiday". The paratroopers were handed back to Russia over the weekend after what a Russian general, Alexei Ragozin, described as "very difficult" negotiations. He said it was unacceptable that the Ukrainians had detained the men, and noted that Russia had returned Ukrainian soldiers who had strayed over the border previously. The Ukrainian soldiers generally crossed the border to escape fighting, whereas Kiev accuses the Russians of coming to Ukraine to wage war. The latest such group, comprising 63 fighters, was sent back to Ukraine in exchange for the captured paratroopers. In interviews, the Russian paratroopers claimed they had not realised they were inside Ukraine until they came under fire. The claims that they crossed the border accidentally have been mocked by Kiev, and during the capture of Novoazovsk earlier in the week there were numerous sightings of "green men" – well-equipped soldiers wearing no insignia but immediately distinguishable from the irregular rebels. NATO said it believed at least 1,000 Russian soldiers were operating inside Ukraine. Putin, however, has insisted that the conflict is an "internal Ukrainian" matter. His rhetoric in recent days has been bullish, comparing the Ukrainian army offensive in the east to the Nazi siege of Leningrad and reminding the west that Russia is a nuclear power and "it's better not to mess with us".